Pendleside Hospice – arguably one of Britain’s worthiest charitable causes – provides much-needed care to individuals with life-limiting illnesses, and at Fuel Card Services, we’re once again doing what we can to highlight and fund the great work of the Burnley-based hospice. 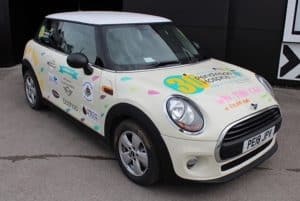 In 2016 and 2017, we teamed up with six local organisations to help raise funds by running a competition to win a Mini hatchback – and we’re doing it again in 2018. For just £2 a ticket, you can be entered into a prize draw to bag yourself a brand new 18-reg three-door Mini One or £10,000 in cash. Over the past few years, this raffle has raised several thousand pounds for the cause, and Pendleside Hospice is hoping that happens again in 2018, with funds going to help support the ongoing operation of this essential facility. Raffle tickets are now available for purchase from pendleside.org.uk and the final draw will be held on Saturday October 6th at St James’ Street in Burnley Town Centre. All funds raised as part of the annual raffle will help to support those in need of extra attention and care as they enter the final days of their lives, after battling life-limiting illnesses. The hospice and its dedicated staff are also there for the families and loved ones of those facing these dark and trying times, providing somewhere to turn for understanding and support in their own hours of need. Funded entirely through charitable donations, Pendleside Hospice needs the support of the local community and those with a few extra pounds in their pockets to continue providing this exemplary service. As a result, Fuel Card Services is calling on as many people as possible to take part in this year’s raffle. After all, it’s for an excellent cause!